Everything seemed peaceful for Dr. John Welles in August of 1952. Despite a lifetime of dealing with secrets, whether keeping them for the sake of a loved one or generating secrets of his own, Dr. Welles believed he had finally found sanctuary in the hills of West Virginia. But it wasn’t to be. By helping Bea Turner, who had become quite dear to him, John made a deal with the representatives of evil itself: the Ku Klux Klan. In his naiveté, he underestimated how truly wicked the Klan was and promised a favor in return to be fulfilled at the Klan leader’s whim. The day the favor was called in set John on his most destructive path so far. He turned to alcohol as a stabilizing factor in his downward spiraling life, yet he was unable to retain any sort of control. Alcohol claimed Dr. Welles for its own, and by submitting to the influence, he continued to lose what was dear to him. One way the doctor kept people from discovering his alcoholism was to chew strong clove gum. Although I never mentioned brands, I always had Adams Clove Gum in mind for John when masking his drinking. He wouldn’t have been the first to do so. 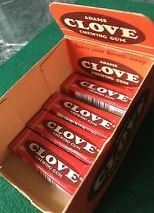 Clove gum was first manufactured by the Thomas Adams Company in 1914. After working as a photographer and glassmaker, Adams tried his hand at inventing. The only thing he invented of any worth was achieved in the 1850s. While working as a secretary to the Mexican President, Antonio López de Santa Anna, the pair attempted the business venture of using chicle as a cheap alternative to expensive rubber tires. After a year of trying, the project was abandoned, and Adams eventually realized he could use chicle to produce a better type of chewing gum. He formed a company that by the late-1880s was making gum sold across the country. In 1899, Thomas Adams became part of a new company called American Chicle Company which merged the six largest American chewing gum manufacturers. He remained a member on its board of directors until 1905 when he died. American Chicle Company was renamed Adams in 1997, and The Adams Company has since been acquired by Cadbury. Today it is known as Cadbury Adams. Cadbury Adams continues to use the same packaging used in 1914 to capitalize on the nostalgia factor, and the formula has remained essentially the same as well. Commercial production of gum dates only to the mid-1800s making clove gum one of the oldest, continuously sold flavored gums on the market. It was especially popular in the Prohibition era, when people believed that they could cover up the scent of alcohol on their breath by chewing it. Every few years, Adams Clove Gum makes an appearance on the market and is scooped up by longtime fans ensuring that candy and gum sellers run out quickly. The Internet helps when looking for new suppliers, however, my recent tour around the Internet didn’t reveal any sources at the moment. While many young people today haven’t heard of clove gum, among its devotees, Thomas Adams will forever be remembered as the father of the modern day chewing gum industry. I remember chewing that gum and loving it. I could get all five sticks in my mouth at once. I also remember Blackjack gum and Teaberry gum. The mention of one flavor usually prompts a memory of the others! Don’t forget Beamans. I’m on a mission to find them, but I’m afraid we’ll have to wait for the company to reissue them again.